PM Narendra Modi tasked his Science, Technology and Innovation Advisory Council to prepare a road map which will bridge the gap between the number of students at these universities, and their contribution to research and development. PM Modi at the 106th Indian Science Congress in Jalandhar, Punjab. Stressing on the need for research at state-funded universities, Prime Minister Narendra Modi on Thursday added to the slogan, "Jai Jawan, Jai Kisan, Jai Vigyan" with a "Jai Anusandhan". The prime minster also tasked his Science, Technology and Innovation Advisory Council to prepare a road map which will bridge the gap between the number of students at these universities, and their contribution to Indian research and development. 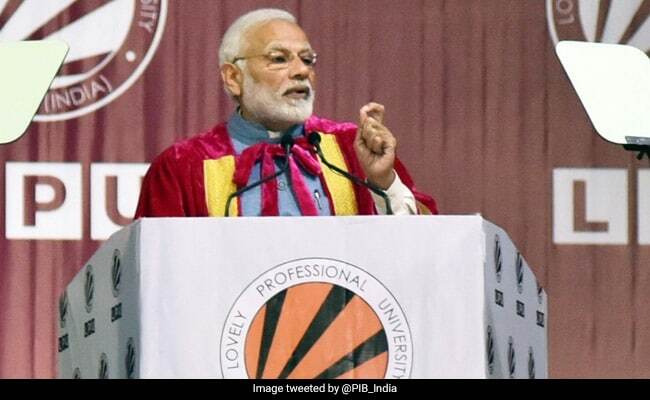 Addressing an audience of at least 20,000 academics participating in the Indian Science Congress in Punjab's Jalandhar, PM Modi said an increased emphasis on research in state funded universities will help India establish its place as an economic superpower. SCOPUS a global database of 69 million records indicated that India ranked in top five nations by the count of number of new research papers published every year. Speaking of Ganganyaan, the much-awaited manned mission to space, the prime minister said the program is on track and the dream of sending Indians into space by 2022 "will be fulfilled on time". The cabinet recently gave its nod to the Rs 10,000-crore programme which will send a three person crew into a low earth orbit from Sriharikota using the Geosynchronous Satellite Launch Vehicle or the GSLV. PM Modi also told Indian scientists to make what they do in their labs accessible to small farmers who own less than two hectares of land. Small farmers need support using frontline modern technologies like big data analytics, artificial intelligence, block chain and images from drones to satellites, he said.